A service first approach to the places we call school ? We need to consider change, and design for that change, if we are going to maximise the value of investment in the learning estate. Investment should reach wider than new build projects alone. Small scale interventions and refurbishment of existing buildings can create equity in the learning experience as well as responding to the demands of capacity and condition. While we talk about suitability and condition of the schools estate we need to start considering the quality of the experience also. A number of national initiatives and policies are driving the need to reconsider the places we call schools. GIRFEC, improving the attainment gap, developing the young work force and increasing community capacity are key drivers, relevant across service areas and sectors. The opportunity to support shared aims through collaborations and co-productions is an increasing focus for local and central government. Waid and Brechin Community Campuses are a good example of the way new approaches to space can support these drivers. The buildings provide a canvas which is allowing internal and external partnerships to evolve and grow. There is real innovation present within the authorities and school management teams who are embracing change. The headteachers both report that the new building has been a great catalyst for change and innovative thinking. The learning environment and inclusion of shared spaces is having a positive impact on the ability to support community learning, social work, Skills Development Scotland, local businesses and other organisations alongside school focused curriculum delivery. College are delivering courses to learners on site and both communities are encouraged to use facilities across the school day. Partnership working can help deliver a wider offer with far greater flexibility, variety of choice and optional pathways. Learning is recognised as a lifelong activity. Flexible approaches to space are needed to facilitate this in the places we call school. 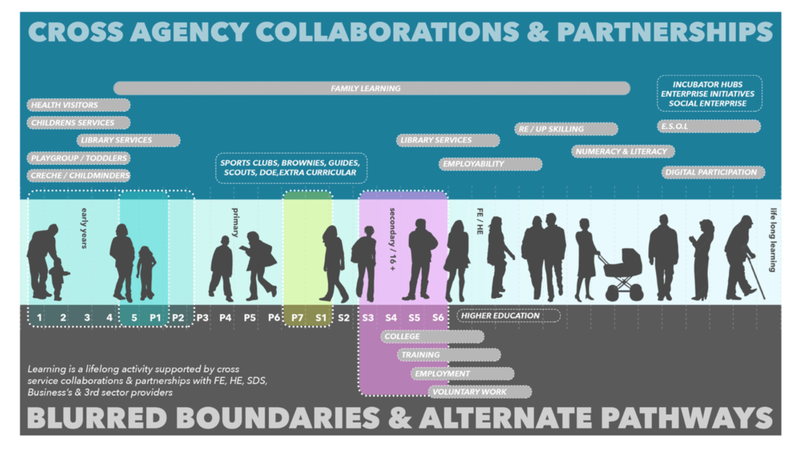 There is an increasing recognition that transitions can be troublesome for many learners, leading to a more streamlined approach which aims to blur the boundaries between sectors, and stages in the learning journey (nursery to primary, primary to secondary, secondary to further and higher education or the world of work). The way we work has changed radically. We are mobile, connected and agile. We work across multiple locations. Collaboration and knowledge sharing are the focus in the work place. We are told that today’s learners need to be ready for a trajectory of multiple careers and that tomorrows work force needs adaptive expertise. New ways of learning and working need to be a key consideration if we are going to support the young work force and encourage a similar agility in our learning environments to that which we experience in working life. As Curriculum for Excellence beds in and matures there is an acceptance that learning has many different modes and that delivering all of these within a single space called a classroom is not always possible or effective. Flexible spaces for enabled individual study, small and large cohort learning are being demanded to compliment traditional learning environments. The economic and environmental impact of the built environment is understood. The need to minimise the carbon footprint of our buildings along with a focus on sustainability is accepted across Scotland. Learning spaces which can be highly utilised across the days, weeks and years are being demanded and embraced. A focus on the quality rather than the quantity of the estate is becoming more and more important as is the focus on healthy buildings. Over the last decade the economic climate has become increasingly harsh. The need to consider improved service delivery within reduced budgets can be supported by looking holistically at available resources (human, technological & physical) to ensure deployment offers maximum value. Shared space comes with an increasing focus on the management of multiplicity and the best way to express ethos, culture and values for a multitude of users. We are told there is a need for learner centric environments which can support a variety of settings to suit personal learning styles and a focus on the development of softer skills. 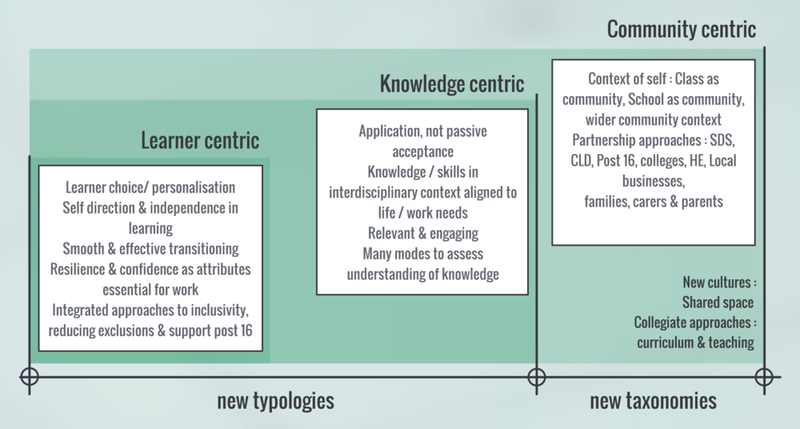 We are told there is also a need for knowledge centric environments, where understanding through application rather than passive acceptance of information downloaded by others is supported. If the learning environment is to respond to these needs we need to provide a range of space typologies which are able to support varying cohort numbers and varying modes of learning from collaborative and interactive to reflective and research focused activities. The drive to encourage wider participation which supports all learners across ages and social circumstances brings a need to develop community centric environments. To do so we need to consider the way space is organised, zoned and the settings it supports as well as the messages the environment conveys. The entrance to the new WAID community campus supports community access (without sign in procedures) to the community cafe, library and shared use meeting spaces. The community feel welcome. The reception is open and access to school, library or local office services are facilitated by staff who are not constrained by their sectoral boundaries. It does not look like a school. Learners work and study alongside the public. The furnishings & interior has been de-institutionalised. A multi use approach can’t be about labelled spaces for different user groups (which in the past has led to under utilised space and an institutional aesthetic). A learning and work settings approach with a focus on the interior and the ‘stuff’ which supports use of space will encourage multiple uses and users. A cafe style booth can be a small group learning space, study space or meeting space. This kind of approach can foster collaboration and cross service working by encouraging incidental interactions. The design of physical space is a key component in supporting flexible approaches. Flexibility of use is maximised in a well specified interior with a settings approach. A big empty space is often seen as being flexible as different furniture can be introduced to accommodate different activities. 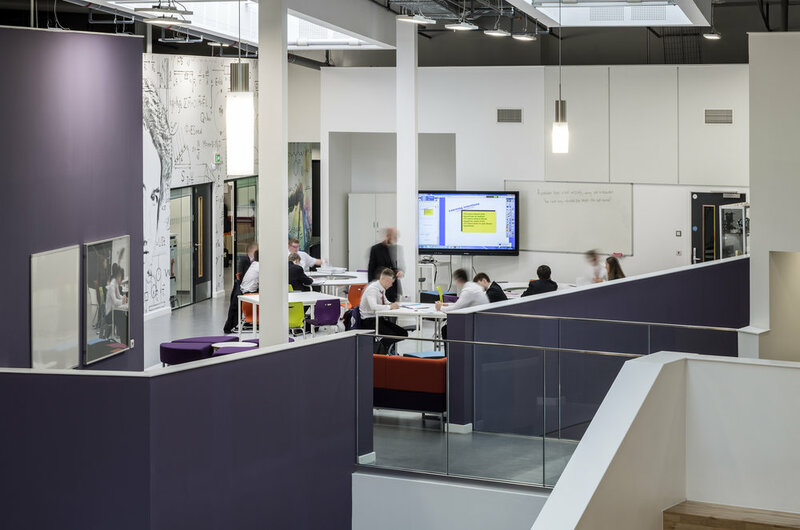 Fixed settings which can be found in West Calder High Schools learning plazas and Boroughmuir High Schools dining area provide more opportunities for multiple activities to be supported at the same time, in the same place. Corridors and the ‘spaces between’ can become active learning spaces if they have adequate depth and well considered Furniture, Fittings and Equipment to allow breakout activity to extend classroom activity. Without the correct FF&E, these spaces will not function optimally, without user engagement they are unlikely to be specified properly. A good quality interior with good quality FF&E is key to encouraging staff and learners to engage in new ways of working and learning. The congruence between the design of physical and virtual space is increasing. The evolving virtual campus in West Lothian is enriching the choices and options for learners within the senior phase. Physical and virtual space are being viewed as tools which support their anywhere, anytime learning programme. This initiative provides opportunities to look more widely at the breadth of physical space which could be available to learners. Advanced Higher Physics students who were accepted into the virtual campus last year benefitted from the use of Higher Education labs to carry out practical work. The use of further and higher education environments and spaces within business for school learners seems like a good opportunity to smooth transitions, maximise the opportunity of available resources and provide enhance learning experiences akin to the real world. Transitions between learning stages are problematic for many learners, particularly those which occur between ‘sectors’. Space can be structured and specified to more easily develop supported transitions for the learner. If space is accepted as a shared resource and not something that teachers / departments own and control then we can consider how space can be used more strategically and flexibly to support transitions more effectively. Some authorities are considering implementing home base classrooms for S1 learners to study general classroom based subjects from which they leave only to access specialist practical spaces. This approach reduces the need for the learner to travel between periods and allows small communities to exist within a larger community. This concept has been discussed for years however it is now being seen as a solution to a demand driven problem and as such there is a robust evidence based decision making process connected to learner outcomes which is informing this particular solution. We call this a service design approach. Shared space and onsite multiplicity requires a new approach to space management and a rethink on who should be responsible for its administration. When users are confident that access, booking, maintenance and sharing protocols are covered it allows them to think differently about categories and zoning of space. Whether considering a corporate office, a college, university or school we believe there is likely to be a need for three main kinds of space. Core space in a school is likely to be the environments which express the identity and brand of that community while also providing secure and safe places for young people. 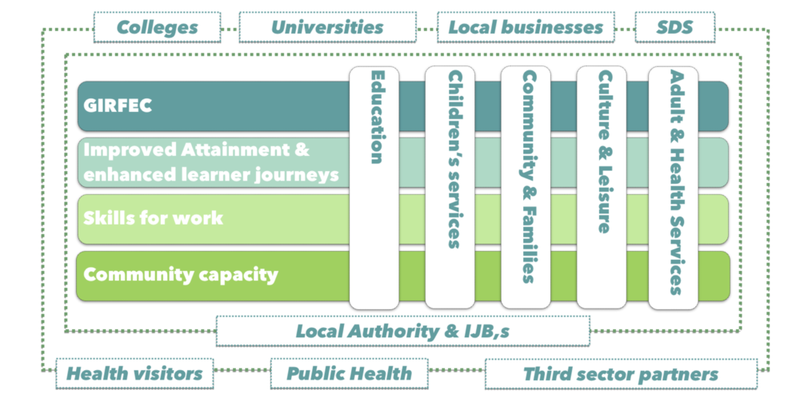 A series of flexible spaces beyond this should be considered which can respond to changing user needs across a day, term or year and which are accessible by school partners with shared aims such as CLD, college, SDS or other service delivery colleagues. In addition to this there may be a series of ‘on demand’ spaces which could be available on or off campus. The new West Dunbartonshire agile work space has accommodation where council meetings are held but is also available to the public to use for weddings and the like. A key question being considered at a strategic level is whether there are alternatives to the traditional concept of a school being the best way to deliver education. When looking to other organisations which have challenged the nature / provision of physical environments which support learning, it is important to remember that each instance provides a solution driven by a particular context and demand. The Minerva Schools at KGI (Keck Graduate Institute) deliver a new approach to undergraduate education. Students travel between 7 global residential locations, where teaching activity is by way of intensive, interactive seminars, many of which are held online. The business model is minimal where resource is focused on learning experiences for students rather than the maintenance of a physical campus. The close collaboration between businesses, Aalto University, Haukilahti and Pohjois-Tapiola Upper Secondary Schools in Otaniemi is part of the realisation of the School as a Service concept. Within this model school is not viewed as a building, but as a platform for collective thinking and learning. Haukilahti Upper Secondary School moved into a building within the Aalto University Campus. The new accommodation is roughly half the square meterage occupied in their previous building on the premise that learners can also utilise the facilities and other resources of several other university buildings alongside university students and faculties. The students of the upper secondary school use the premises of the university’s departments of Applied Physics, Chemistry and Art as well as the sports facilities in Otahalli. They can also sign up for various courses delivered through the university. In the future, there is an intention to situate the facilities of Haukilahti Upper Secondary School along the metro corridor. When there are several upper secondary schools along the metro line, it will be easy for students to move between the schools and for more joint course selections to be facilitated. A building project, whether a small interiors or furniture intervention, a refurbishment, a new building or an estate strategy is an excellent change catalyst. Change however comes with consequences and we need to look wider than the building process if buildings are to be used as intended. In our experience there are a number of factors which are critical to the success of innovation in building projects where change is required. A strong vision is required in order to determine a compelling reason for change. To deliver this, governance, process and accountability need to be considered. An understanding of the benefits and outcomes which are hoped for, and an articulation of what success looks like, is necessary to allow key constructs to be measured on completion and in Post Occupancy Evaluation. Successful change requires committed, aligned and unwavering leadership. Leaders need to genuinely and actively embrace the change (and be seen to do so). It requires a leadership team whose members are all aligned and working together to achieve the desired outcomes. Achieving flexibility is not just about the way we specify, design and manage space, it is about cultural change and adapting the way we do things. Participation, communication and change management are all vital tools which can create a culture that embraces and encourages the change. Getting the process right is also an important part of driving successful outcomes. Service design should lead environmental design as part of an integrated process where the use of space informs modelling and testing.